Shales are complex reservoirs and present significant challenges to petrophysical characterization and physical core analysis. Key reservoir parameters for shale deposits include: thermal maturity, reservoir thickness, total organic carbon (TOC) content, adsorbed gas fraction, free gas fraction within the pores and fractures, and transport properties. Thermal maturity and reservoir thickness are routinely measured. 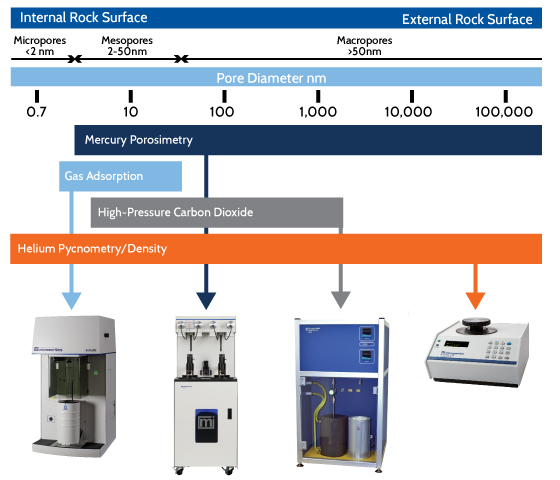 The remaining four parameters require a creative approach that can utilize a number of petrophysical rock core measurement techniques. Micromeritics provides key analytical tools for evaluating rock cores and shale reservoir potential. Micromeritics also provides computational and modeling tools for modeling and predicting shale reservoir potential. It is of vital importance to determine a reservoir’s capacity for adsorption of hydrocarbon gas. 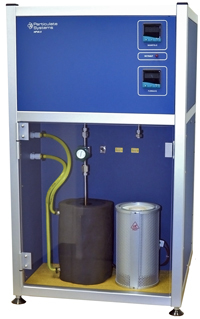 Pore volume provides a measurement of the capacity of organic and non-organic components of the shale to store gas. Through the application of sub-critical nitrogen or carbon dioxide gas adsorption, the acquired analytical data will indicate capacity as well as reveal information about pore volume, area, and pore distribution. 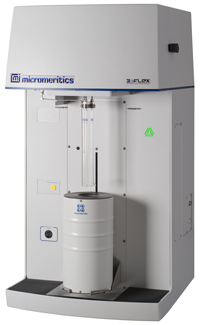 Micromeritics’ 3Flex Surface Characterization Analyzer is a fully automated, three-station instrument capable of high-throughput surface area, mesopore, and micropore analyses. Many shale gas formations are over pressured. Super critical gas-adsorption parameters are needed to estimate total amount of gas in the system. Measuring the shale capacity for adsorption of hydrogen gas at pressures and temperatures that may exist at depths is important to the evalutaion of a reservoir. High-pressure methane can be dosed onto shale sample to generate adsorption and desorption isotherms. This provides the methane capacity of the shale at specific pressures and temperatures. The adsorption isotherm can be used to calculate the Langmuir surface area and volume of the shale. The Langmuir volume is the uptake of methane at infinite pressure - the maximum possible volume of methane that can be adsorbed to the surface of the sample. HPVA II 系列 of gas adsorption instruments uses the static volume method to obtain high-pressure adsorption and desorption isotherms. Mercury intrusion porosimetry is a valuable method for characterizing relative pore space dimensions. Mercury intrusion porosimetry permits the calculation of numerous sample properties such as pore size distributions, total pore volume, total pore surface area, median pore throat diameter, and sample densities (bulk and skeletal). Capillary behavior and permeability are critical to reservoir behavior. This method is particularly useful in evaluation reservoir quality variations within a shale play and in petrotyping shale. While not quantitative, these estimates can provide a relative assessment of the variation in permeability. Mercury intrusion, used in conjunction with pycnometer data, provides estimates of the fraction of pore space that is connected and as such producible. Mercury intrusion also provides information in terms of tortuosity, or the loss of interconnectivity of micro channels under depth conditions, that will lower permeability, as well as gas and water flowability. AutoPore V 系列 uses mercury intrusion and extrusion to determine total pore volume, pore size distribution, percent porosity, density, compaction/compression, and fluid transport properties. Grain density measurement of core samples is an important parameter that is used to determine the gas storage potential of rock reservoirs. Gas pycnometry is performed on intact cores or crushed samples to measure grain volume which, with the initial mass, yields grain density. Measured bulk and grain density are combined to deduce porosity. 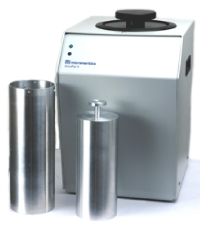 A gas displacement pycnometer, with a larger sample chamber designed specifically to accept intact drill cores, provides a low-cost, time-saving, non-destructive technique for measuring the skeletal volume. Knowing the envelope and skeletal volumes of a score sample allows the total pore volume percent porosity of the sample to be determined. CorePyc designed for the specific needs of operations that require pore volume knowledge of intact sample cores. The use of NMR for geophysical characterization of core samples is well accepted. NMR provides information for diffusive characterization of shale samples in terms of fluid mobility, effective porosity, and to determine kerogen conversion. Core samples contain significant amounts of metallic minerals that can contaminate NMR measurements and skew results. It is prudent to measure the metallic content of the core samples to make the analyst aware of any possible contamination. The experimental approach can then be adjusted as required. 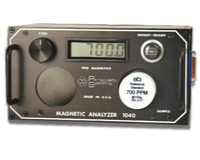 MA-1040 磁性分析仪detects and measures low levels of metalic iron, nickel, or cobalt content in sample materials.